Plastic Compounding Market size was more than USD 32 billion in 2016 and will witness 6.0% CAGR during the projected timespan. Plastics have been the omnipresent workhorse material of the modern economy for their unmatched functional properties and the lower costs. Modernization of plastic industry will hold strong potential for plastic compounding market in the near future. Plastic compounders have been identified as crucial contributors to the industry, for their key material knowledge of plastic resins and their suitability for compounding. Medical device designers have been shifting away from metal and towards plastic as their material of choice particularly for 3D printing applications. These include: prosthetic body parts, orthopedic devices, casing of an open MRI machines etc. Global plastic compounding market will witness substantial gains in 3D printing applications across various consumer goods, automotive and medical segments. Intensifying construction expenditure will propel plastic compounding market in the coming years. Advanced engineered plastics have been steadily replacing traditional materials in this sector. Construction applications of plastic compounding include pipes & guttering, window and door profiles, roofing, glazing, domes/sky lights, flooring and building panels. Future construction projects, including roads & highways, commercial buildings, residential projects, urban transportation, hydropower, etc. will further boost the plastic compounding market. The U.S. spending on construction has risen significantly from USD 800 billion in 2012 to USD 1100 billion in 2016. Rising infrastructural investments along with increased end-user demand for minimal maintenance materials, reduced weight & savings in raw material costs will drive the industry. However, oscillating feedstock prices may hamper plastic compounding market size by 2024. Thermoplastic polymers are estimated to lead the global plastic compounding market by 2024. The segment held a market share over 50% in 2016. 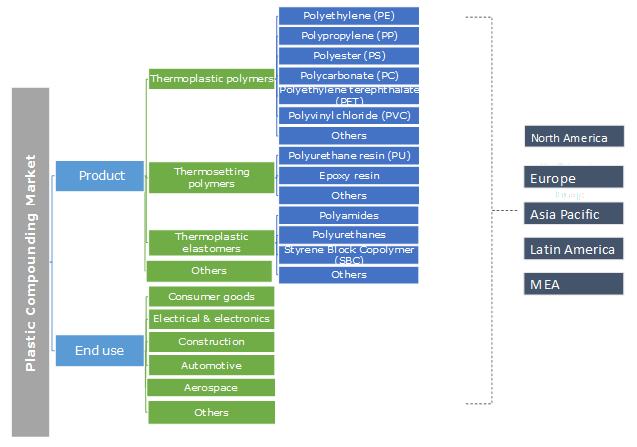 The massive share of thermoplastic polymers is attributed to their wide range of applications and lower manufacturing costs compared to the other segments. Polyethylene (PE) had generated revenue close to USD 7 billion in 2016 and is likely to continue to be the leading sub segment in thermoplastic polymers by 2024. These will have strong demand from the packaging industry for a range of applications such as: automotive interior, consumer goods packaging, bags, geomembranes, containers including bottles, etc. Polypropylene will be another key sub segment in thermoplastic polymers. Thermosetting polymers generated revenue over USD 4 billion in 2016. The sub-segment polyurethanes will observe significant demand for manufacturing the car parts, flooring, insulating foams, print rollers, mattresses, synthetic fibers, shoe soles, etc. in the coming years. Polyurethanes thermosetting polymers generated over USD 1.5 billion in 2016 and will hold substantial market share by 2024. 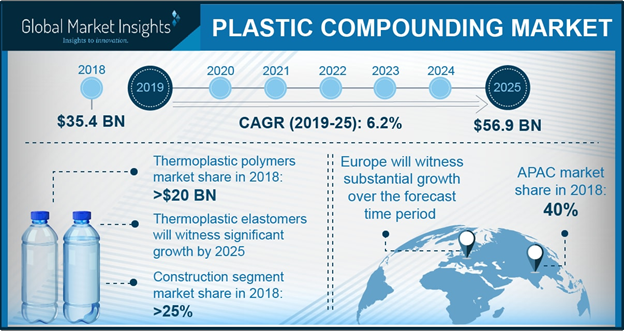 Global plastic compounding market for other materials including bio-plastics are estimated to be the fastest segment with estimated gains close to 8% CAGR over the forecast period. Large international companies are engaged in using bioplastics for packaging. For instance, Coca-cola had created their Plantbottle program, where they make plastic bottles that are 30% plant based. Bioplastic Feedstock Alliance (BFA) was launched in 2013 by various industry giants including: The Coca-Cola Company, Ford, Danone, Nestle, Heinz, Nike, Unilever and Procter & Gamble. Such initiatives will boost the industry by 2024. Plastic compounding industry was led by automotive applications in 2016. The segment generated over USD 10 billion in 2016 and is projected to hold the largest share over the forecast timespan. Regulations regarding vehicular weight reduction in the Western regions particularly, the U.S. and EU, have been the prime driving factor for growing plastic consumption in automobile. Light weight vehicle holds a crucial role in meeting regulations, since vehicle weight and fuel consumption are co-related. Every single 100-kg saving in weight of vehicle can result in reduction of fuel consumption by around 0.5L/ 100 km in case of light trucks and 0.4L/100km from the cars. The manufacturers have been striving to achieve weight reduction by substituting metal parts with plastic along with changes in vehicle design. These traits will boost the plastic compounding market for automotive industry in the near future. The aerospace applications generated revenue close to USD 3 billion in global plastic compounding market in 2016. Plastics result in weight savings of up to 60% compared to aluminum. They also help in reducing overall operational costs. The major applications in aircraft range from lighting systems, seats, the on-board kitchen & cooling systems, in the oxygen supply, drinking water & disposal systems, as well as freight loading facilities, etc. Increasing lightweight construction demand in order to improve aircraft fuel efficiency and performance is likely to drive aerospace plastics demand. Asia Pacific led the overall plastic compounding market size with market share over 40% in 2016, The region will continue similar trends by 2024 with rising food & beverage industry having a strong demand for plastics in packaging applications. Rising number of automotive manufacturing plants due to large raw material and skilled labor availability, will drive the plastic compounding market size in Asia Pacific. The regional automobile industry had the highest share in global automobile sale (passenger cars, light commercial vehicles, trucks) with China, India, Japan, Australia, Indonesia, Thailand and Malaysia accounting for over 40 million units in 2016. In 2005, China reported a total of 5.7 million vehicles, which increased to 28 million vehicles in 2016. Indian automobile sector has shown tremendous growth post 2010, reporting 3. 7 million vehicle sales in 2016. Such trends indicate strong scope for plastic compounding in Asia Pacific by 2024. Europe had accounted for more than 20% of the global plastic compounding market in 2016. Presence of significant automobile manufacturers in the region will have a positive influence on the plastic compounding market growth. Over 60% demand in Europe has been concentrated in Germany, Italy, France, Spain, UK and Poland. With the pioneering network of chemical parks and swift access to all parts of plastic industry value chain, Germany has been setting an international standard as a plastic industry location. Key plastic compounding market players are LyondellBasell Industries, SABIC, RTP Company, A. Schulman, BASF, Solvay, Dow Chemical. The market is competitive with more than 7 companies accounting for over 55% of the market as of 2016. Industry participants are focusing on increasing production capacities to gain the competitive edge. For instance, in June 2017, BASF expanded its compounding plant at Schwarzheide site in Germany, up to 70,000 tons, In October 2015, BASF inaugurated its engineering plastics compounding plant in Yesan, South Korea, with annual capacity of 36,000 metric tons. The expansion strengthened company’s production for faster supply of Ultramid (PA) and Ultradur (PBT) in Korea. Plastic compounding involves plastic formulations through blending polymers and additives in molten state. Polypropylene and polyethylene are the most preferred base polymers in the plastic compounding. Modifiers in the form of small pellets or powder may be further added to these base polymers. Global plastic compounding market is likely to witness substantial potential from various end-user industries including: consumer goods, electrical & electronics, automotive, aerospace, construction, etc.